The thought of having bed bugs in your home is a scary and unnerving prospect. Bed bugs feed on the blood of its host (you and your pets). While they are not known to carry diseases, they will leave you with uncomfortable red itchy marks. 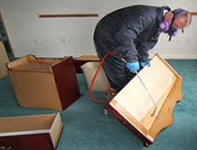 Pinnacle Pest Control provides various bed bug pest control services in the Roseville Area. 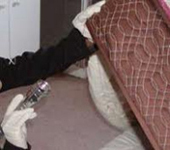 Our experienced technicians perform a stringent protocol to ensure complete eradication of the bed bugs in your home. We also ensure that your home is treated with respect during the extermination process to protect you belongings. What are Bed Bugs and Where Did They Come From? Bed Bugs are small parasitic insects that are reddish brown in color as adults. An adult bed bug is about ¼ inch in length. They are oval shaped and feed on the blood of humans or animals, preferring humans. Bedbugs are mostly active at night, but aren’t completely nocturnal. They can show themselves during the day as well. The eggs of Bed Bugs are about 1 mm small and a translucent white color, making them hard to find. About 1 to 2 months after hatching Beg Bugs are fully mature and start laying their own eggs. Bed Bugs can live anywhere, despite their name. They can be found in the furniture in your home, cracks in wood and of course your bed. While they are excellent travellers, hitching a ride in luggage, backpacks and even your clothing, bedbugs cannot fly. Given their size and ability to travel, pinpointing exactly how you got an infestation can be difficult. Of course, the most common way of coming into contact with Bed Bugs is through travelling. The best way to keep your home free from Bed Bugs is through prevention and early detection. When travelling, check your hotel room beds for signs of bed bugs as well as your luggage. If you suspect you’ve been in contact with Bed Bugs, vacate your hotel room and bag your luggage in plastic. Do not bring your belongings back into your home, until thoroughly inspected. Pinnacle Pest Control’s Trained Technicians will perform a thorough inspection of your home to determine the extent of your Beg Bug infestation. 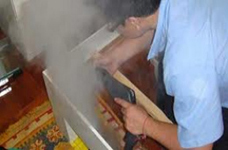 Your home will then be treated with heat to ensure the infestation is completely exterminated. We will also inspect and treat where needed all cracks and crevices; including floors, walls and furniture.